Copyright is held by the author/owner. "The Amber Room on the Web" project provides wide public access to information about the process of reconstruction of the Amber Room of the Catherine Palace outside of St. Petersburg, Russia. The project is an integral part of the museum's digital policy, allowing it to work towards fulfilling the demand for online access to its information resources from Russia and the worldwide audience. It serves as an information gateway to tell and illustrate the entire process of the reconstruction of the Amber Room from beginning to end. The web page reveals the specific goals of the projects, its history and conception, the planning and creation of the content, web development, technological applications, navigation, usability, design issues and basic evaluation parameters. It is possible to say without exaggeration that the secret of the Amber Room is one of the most stirring riddles of the twentieth century, not only in Russia, but all over the world. As with any plot having epic implications, the story of the Amber Room tends to grow on itself, acquiring new details, names, and twists of plot. Its mysterious history induces new and new bursts of interest, which are reflected in periodically appearing headlines in authoritative editions, books of famous writers and publicists, documentary films and TV programs. An inherent part of any myth is a very approximate, if not at all inadequate, understanding of real events around the phenomenon in question. The Amber Room is not an exception. Crimes during the post-war history of the room amplified by inevitable political gamble have resulted in the fact that the "solid residual" of information remaining in the public consciousness is mostly pathos of stories about its unusual beauty and about the drama of its plunder and loss. Until recently, the importance of the Amber Room as an art monument, information about its history, and, finally, the labor-intensive, long-term work of dozens of people reconstructing this unique monument remained to be the unknown page. Thus, before initiating the project "The Amber Room on the Web," we conceptualized a project which could fill the informational gap about the Amber Room not only as a monument of art, but also as a cultural phenomenon having strong political and historical implications, some of them rather provocative. If the Amber Room had not disappeared during World War II, we would celebrate its tercentenary in 2001. Prussian kings and Russian emperors, architects and artists, leaders of the Third Reich and Soviet leaders, Maecenases and businessmen, treasure hunters and outstanding scientists, not to mention craftsmen, were involved in the history of the "Eighth Wonder of the World". During World War II, in 1944, when the Germans retreated from Tzarskoe Selo (town Pushkin), they dismantled amber panels, packed them into crates, and took them in an unknown direction. Since then the room has been lost. Search efforts have so far been unsuccessful. Prior to the beginning of the project "The Amber Room on the Web," the researchers of the State Museum Reserve "Tzarskoe Selo" and of the Association "Restorer" carried out laborious searches of all representational materials relating to its interior. 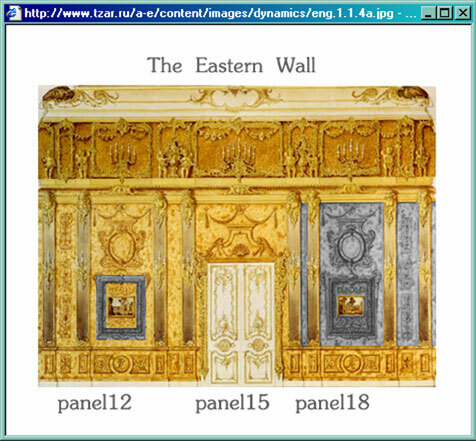 The results of this work have shown that drawings of the original Amber Room existed - neither the initial Berlin variation, nor the subsequent St. Petersburg and Tzarskoe Selo ones. The unique interior was fixed neither in figures, nor in pictures by artists (except a rather schematically executed water-color of the artist Grekhnev from the collection of the Museum Reserve "Tzarskoe Selo"). Thus the primary sources, both for reconstruction of the Amber Room and for the historical part of the project, were photos. Any pictures made of the interior have been major documentary resources, allowing for reconstruction of its image, containing all details. Eighty-six photos of the Amber Room have been found in the State Hermitage, the State Russian Museum, the Leningrad Branch of the Archaeology Institute of the USSR of the Academy of Sciences, the State Inspection on Protection of Monuments of Leningrad, and other archives in the city. They contained pictures beginning with one published by Theophile Gautier in 1859, and ending with ones taken in 1942-1945 after the stolen amber panels had been installed in the Koenigsburg Order Castle. Careful studies of the photographs have shown the presence of numerous losses and various levels in the amber decor of the interior and required serious research devoted to more than two hundred years of the history of the Amber Room in Russia. Due to many years of research, it became possible to determine the structure of initial decoration of the Berlin study, the origin of the Florentine mosaics built into the interior as well as the time of occurrence of later additions of amber decorations to the room. Simultaneously, preparation for the project of reconstruction of the Amber Room was carried out under the supervision of the main architect of the Catherine Palace, the esteemed scholar of culture Alexander Kedrinsky. The design documentation included materials on restoration of all of the art decorations of the room: wooden gilded carving, mirror pilasters, painted plafond, and the inlaid floor. The main distinction between the process of reconstruction of the Amber Room and a typical process of restoration and conservation of an art monument was the absence of any original details of the monument and the need to recreate it completely based on a very limited number of reliable sources. 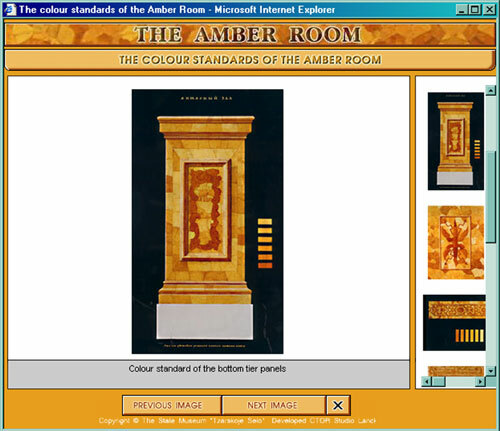 By the time the project began, we had all of the collected illustrative materials at our disposal and were able to state the general objective of the project "The Amber Room on the Web": to build the web site "The Amber Room" in Russian and English providing public access to information about the process of reconstruction of the monument. The project is seen as an important integral part of the museum's digital policy, allowing it to work towards fulfilling the demand for online access to its information resources from Russia and the worldwide audience. It serves as an information gateway to tell and illustrate the entire process of reconstruction of the Amber Room from beginning to end. To represent the Amber Room as a unique monument of art of the eighteenth century. To provide basic information about its history. To provide basic didactic and visual information about its structure and collection of amber objects. To provide detailed and updated information about the process of its reconstruction - scientific research, technologies, and methods, and to enhance the visitor's retention of the knowledge and understanding of the ongoing process. To give visitors the awareness that they are contemporaries of a unique event in world art history. To give visitors an opportunity to join, to test, to try themselves, and to become co-authors of the ongoing process by offering them co-authorship in the form of a game. In the long term - to give the user an opportunity to remember this unique experience - to get an original product made by the hands of the people who have been involved in the recreation of this famous monument. To describe the importance of art conservation in the Tzarskoe Selo mission. To document and archive the process for later reference and educational applications. To provide basic information about the Tzarskoe Selo Amber Workshop. This concept was of great interest to the museum staff because it would allow them to develop their first online exhibit tied directly to a permanent on-site exhibition of the Amber Room. Only recreated parts of the interior decor are exhibited in the on-site permanent exhibition and has nothing to do with the process of restoration itself taking place in the building of the Tzarskoe Selo Amber Workshop closed to conventional visitors. With this type of recognition of restoration and with the positive aspects of the project's visibility, the online exhibit is of special importance. The on-site exhibition of the Amber Room is located in the Catherine Palace in the historical place of the Amber Room as it stands in the Golden Enfilade of the palace. No introductory space is provided as the visitor finds himself immediately in the famous monument upon entering the room. Thus, the on-line exhibit is to lift the veil off the ongoing process of recreation and allow museum visitors to view from afar the restoration process as it was worked on in the Tzarskoe Selo Amber Workshop. Because of its scale and the public interest in the process of recreation, the Museum was very interested in finding a way to utilize the museum's web site to promote and document the project. Reconstruction the Amber Room began in 1979, and during that 20 years, the project has been financed by the federal budget with $7,754,000. During this time the team of the Tzarskoje Selo Amber Workshop succeeded in reconstructing 30% of the amber decor, but taking into consideration all the preparatory work done in the past two decades, one may estimate the degree of its completion as 60%. During the period of state financing, the last panel was installed in the Amber Room in 1996. The financing from the federal budget was unstable, therefore the Direction of the State Museum Reserve "Tzarskoe Selo" decided to look for additional sources of financing. An agreement concerning exclusive sponsorship of the reconstruction of the Amber Room was signed on September 6, 1999 by the Ministry for Cultural Affairs of the Russian Federation, the Tzarskoje Selo State Museum, and "Ruhrgas AG". The grant from "Ruhrgas AG" for completing restoration of the Amber Room amounts to US$3.5 million. Funding for the project on the web was secured through the State Museum Reserve "Tzarskoe Selo" project funds, and the project was undertaken as public relations action to advocate and publicize these events. 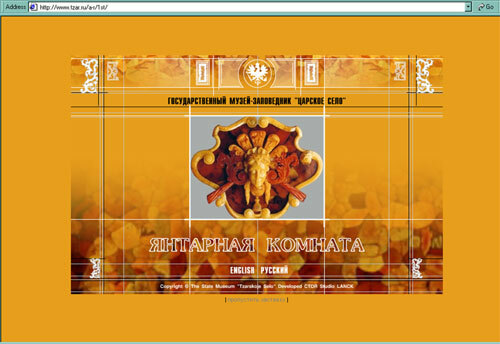 November 2000 - September 2001 - complete redesign of basic web site of the State Museum Reserve "Tzarskoe Selo" (http://www.tzar.ru), incorporation of additional visual representation tools on the web site of the Amber Room, the building of community, and the addition of e-commerce options, creating "The Amber Room" CD-ROM. October 2001 - December 2002 - finalizing basic project development, evaluating the project, and planning further steps to ensure thematic continuity to site content. In this paper we analyze some results of first stage of the project implementation. Over the last two years the Tzarskoe Selo Museum Reserve has produced an award winning web site with an excellent content. With the development of the museum web site since early 1999, the Museum explored the development of a wide variety of online resources about Tzarskoe Selo, its history and ongoing activity. Through internal and external recognition for this project, its complete redesign using new technologies, and being powered with multimedia in 2000, the Amber Room project was born. The museum staff's interest in utilizing interpretive online technology versus an ongoing recreation process was a key aspect of this project. After the 1991-1992 exhibition in Berlin, Gettingen, Frankenstahl, Luneburg, Munster, Aalen and Krefeld, Germany, "Amber: Pride of the Tsars", the 1993-1994 exhibition in Taibei, Taiwan, "Treasures of the Summer Residence of the Russian Emperors at Tzarskoe Selo", and the 1997 exhibition in New York, San Francisco, Washington, Milwaukee, USA, "Amber: Window to the Past," focusing on amber objects from the collection of the Tzarskoe Selo Museum and the recreation of the Amber Room the working group of the web site was created. Soon after the team of the working group was approved, a number of planning meetings were held to introduce and discuss the on-site and online aspects of the exhibit. Strategies were developed to re-purpose and share information between the Tzarskoe Selo Amber Workshop and Tzarskoe Selo Museum Reserve and apply graphic resources as efficiently as possible. Plans were made to coordinate the work of text writers and designers developing the didactics for the web site. Plans were also set for the production contract. This was awarded to CTORSTUDIO & Lanck. All curatorial and research work was to be done by the museum, all issues concerning web development including strategic web content planning was to be done by the studio and the author of the paper acting on behalf of it. Curators identified details and a timeline for the reconstruction process and key resources related to the history of the Amber Room to ensure consistency in style and form. the Tzarskoe Selo Amber Workshop offered its assistance in generating a system for visually documenting the process. Tools and methods of processing images: the conventional camera and painting in watercolors. The conventional quality camera proved to be one of the most indispensable tools, allowing the Tzarskoe Selo Amber Workshop staff photographer to shoot and "process" images on an ongoing basis. The images were digitized, organized and archived on the computer in a form of web gallery As the general outline of the reconstruction process was not designed from the onset to allow documentation of the actual process to be inserted into the program, additional attempts were made to coordinate on-line and on-site documentation. Each time any of amber panels was changed, flexible production environment and detailed visual documentation was generated. A standard page of the web site contains textual information and images. The web site must run trouble-free on as many browsers and platforms as possible, so versions suitable for users both with and with-out Flash plug-in were created. An advanced version included the features and plug-in content. The site was designed to work with the major web browsers version 4 and above. The web site was compiled from the source databases. The database was thus used to manage all the data for the system - text, images, and design data. The database and system structure continually developed as the project progressed and new materials were added. 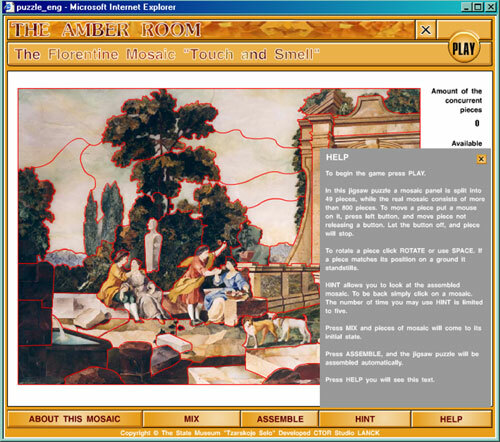 In addition to the object and contextual information, a variety of extra features were added to make the system more entertaining and informative to the user--a jigsaw puzzle, search engine, feedback form, and an audio sample on the first page. Amber from the collection of the State Museum Reserve "Tzarskoe Selo"
The Amber Objects of German, Danish and Polish craftsmen of 17th-18th c.
Amber objects created in Western Europe and in the East in the 19th-early 20th c.
Problems of financing of the Works. The joint project of the German concern "Ruhrgas AG" and the State Museum Reserve "Tzarskoe Selo"
Jigsaw puzzle "Assemble fragments of the Amber Room yourself"
To simplify and accelerate the process of web site development, the CTORSTUDIO's WebNavigation technology was used to provide an optimal way of logical and representational structure definition. Separating the process of content delivery from logical structure definition and HTML template design and encoding provided a simple way to change some portions of the web site. It was especially important for updating a dynamic part of the content and images. Though contextual links and cross-referencing help visitors to navigate, navigation of the project combines two paradigms: linear and nonlinear (Michael Douma, 2000). Linear navigation is used only on the 3rd level; the two first levels are subjects of nonlinear navigation. To enhance the visitor's experience, the menu of the web site is dynamic. The visitor uses a menu as he clicks on the section, and underlying sub-sections are displayed using Macromedia Shockwave (or Flash). This enables transparency of navigation. CTORSTUDIO's WebNavigation was designed with additional modules, which customize site behavior relying on user browser capabilities, e.g. if a user doesn't have a Macromedia Flash plug-in 4.0+ installed on his computer, an equivalent version of add-ons will be loaded. Certainly it lacks presentation capabilities, but in terms of functionality, it works well. As for image navigation on the pages, it allows the visitor to view many images and magnify them. One of the most dynamic sections is the section of the site entitled, "The dynamics of the works to reconstruct the Amber Room since 1999", which provides users with a virtual journal of the ongoing progress of the project. It contains scanned watercolor images of all walls, which would be archived for further documentation of the project. The reconstructed amber panels and Florentine mosaic are filled with color, those being in progress are black-and-white (fig.2). To facilitate efficient maintenance and expansion with a minimal amount of additional markup, a special template was made. These interactive online materials contributed to the popularity of the project. Fig. 2. The Eastern wall of the Amber Room with numbers of panels and display of reconstructed fragments. A special template for pipeline photo galleries was also made to walk through the reconstruction process, explore its key stages, and see it directly on the panels being restored. Its methodology was designed to expand the visitor's context for the reconstruction by highlighting items such as color and molded standards, technology of the working process (four stages), and different kinds of art processing of amber (the flat assembling, the profile composite carving, the figured carving, and the internal engraving (intalia)), etc. In pipeline photo galleries, images can be viewed in sequence, both thumbnails and magnified ones. This creates an effect of a pipeline viewing conveyer, allowing details of each image to be directly compared. When the visitor points his cursor at a region, a floating description is displayed next to the cursor (fig. 3). Fig.3. Pipeline photo gallery "the color standards of the Amber Room". Fig. 4. The front page of the Amber Room web site. To develop skills in assembling jigsaw puzzles. This creative element serves as a tool for the visitor to remember and learn through experience. The puzzle should be not only entertaining, but also educational. The algorithm of the action of the puzzle is designed by the principle "from simple - to complex". Fig. 5. The interface of the jigsaw puzzle "Touch and Smell". The search engine online is a three-part section including keyword, condition and/or, and case intensitive/sentitive. The feedback section was designed to serve as a catch-all for questions posed by the public. Visitors are invited to submit questions and feedback via an online form. The Tzarskoe Selo museum staff members managed the process of collecting and posting the responses to these questions. While curators were very cooperative in providing extensive amounts of information for the online exhibition, in the near future we plan to create a special F.A.Q. page based on ongoing feedback material. User statistics for the web site increased dramatically over opening of this part of the web site. WebNavigation allows us to simplify and speed up the process of web site creation by providing a rapid way of logical and representation structure definition. It allows dynamic definition and redefinition of the logical structure and templates used on a site. By separating the process of the content delivery from the logical structure definition and HTML-templates design and coding, it can provide a simple way to change some portions of the website without an additional and unnecessary (if right tools have been chosen) job. This is especially helpful during the dynamic site updates, showing the process that lasts in time. WebNavigation used on "The Amber Room" website is upgraded with additional modules that customize the site behavior relying on a user browser capabilities. e.g., if a user doesn't have a Macromedia Flash plugin 4.0+ installed on his computer, an equivalent version without Flash add-ons will be loaded, with a small lack of presentation but none in functionality (fig. 6). Fig. 6. The architecture of the WebNavigation. At first, the user generates a request for a specific page. This page is not statically existent on a server, so web server forwards the request to the WebNavigation (control flow #1). WebNavigation analyzes the forwarded request and chooses a presentation template to be used (control flow #2) and a content to be delivered (control flow #3). The template can contain a presentation information, such a design used on a page, and navigation links information, such as information about where and how the navigation links should be inserted. Content can be handled either as a static data or as dynamic requests from the external data sources, such a database. After these steps, template and content are combined together using special commands, inserted in the template and forwarded to the web server (control flow #4) in case of adding special information, such HTTP headers, or performing additional processing for this page (thus can be applying XSL stylesheet to an XML data, for example). The final generated page with the according HTTP headers and other information is delivered to the user. Also Flash is used by its presentation capabilities to give the end user very attractive visual effects. It relies on the idea of the visual museum exhibition with the user interaction features. 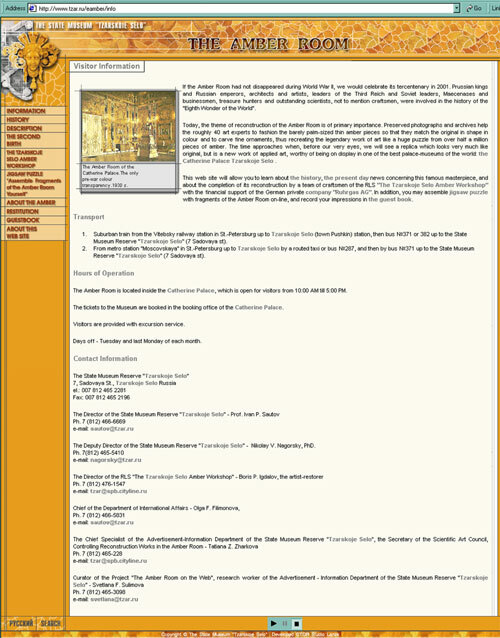 The analysis of on-line surveys located on the web site of the Tzarskoe Selo Museum Reserve web site (http://eng.tzar.ru/guestbook/brief_survey). Its Russian version is more complete and is designed as a sociological survey study of on-line visitors capturing information about personal relevance, learning outcomes, credibility, etc. The analysis of the responses and electronic letters. A sophisticated evaluation model upon finalizing the project will include a special survey study, where both descriptive and explanatory findings will be noted. We have presented the solution that we have provided in the web site for the Amber Room project. The project combines multimedia and cutting-edge technology with well-prepared and well-managed content for a global audience, which allows it to capture information about the ongoing reconstruction process. It also deals with the cultural and historical implications of the current status of the famous monument, enabled through communication between the Museum and its audience. The project, which is still in progress, strongly supports the museum mission and helps to promote the Tzarskoe Selo Amber Workshop as a center for excellence in carrying out restoration and conservation of objects from amber. The web site of the Amber Room was created with active support of Prof. Ivan Sautov (the Director of the Museum), Dr. Nikolay Nagorsky (the Deputy Director), and artist-restorer Boris Igdalov (the Director of the RLS "Tzarskoje Selo Amber Workshop"). Our credits also to Tatiana Zharkova (Chief Specialist of the Advertisement and Information Department), Svetlana Sulimova (Scientific Worker of the Advertisement and Information Department), Natalya Grigorovich (Senior Research Worker, curator of the collection of amber items of the Museum Reserve "Tzarskoje Selo"), Lyudmila Khaikina (Art Consultant of the "Tzarskoje Selo Amber Workshop"), and Irina Yarotskaya (Architect of the "Tzarskoje Selo Amber Workshop"). Michael Douma (2000). Lessons learned from WebExhibits.org: Practical suggestions for good design. In: Museums and the Web 2000. Proceedings. Ed. by David Bearman & Jennifer Trant. CD-ROM. Graduated from Anthropology Dept. of the Leningrad State University in 1985. In 1992 earned her PhD in Peter the Great Museum of Anthropology and Ethnography (Kunstkammer) of the Russian Academy of Science. She was one of the key persons who created the Kunstkammer's web site, has written 18 articles on the factors which facilitate visitor learning and satisfaction, and highlighting the approaches to design and evaluation of interactive devices. She participated in the EVA'99 Florence, EVA'Moscow 98 and 99, ICHIM'99 Washington DC, 1999 Summer Amsterdam-Maastricht "Digital Cultural Heritage" University, Museums and the Web conference in Minneapolis in 2000, VSMM and EVA in Gifu in 2000, was a participant of the International Visiting Program of the US State Dept. in the field of the museum web in 2000, as well as a participant of the number of national conferences on museum informatics. In 1998-1999 she participated in a number of museum projects on the web. Today, along with maintaining the Kunstkammer web site, she develops several new projects on the web as an art director and manager, among them "The Amber Room", the web site of the Tzarskoe Selo (www.tzar.ru), "Museums of St.-Petersburg" (http://www.allmuseums.spb.ru), web site of Veliky Novgorod State Museum (http://www.novgorod-museum.ru) etc. Bogomazova is a member of the Program Committee of the Museums and the Web 2001 conference and the ICHIM'2001 conference.